I need to be on the board of directors of something. I read about all these motivated people and wonder, "What do they have that I don't have?" And it is being on the board of directors of something. It sounds so important. So, to this end, I have created the Social Climate Change Task Force. SOCC-TAF. Not very catchy. Let me work on that. SOCIAL would be a better acronym. Social Change Initiative League. Ugh. There has to be a better name! Well, that's the topic for the first meeting. A better name. Anyway, I'm on the board of directors of the Social Climate Change Task Force and I'm recruiting people (social philosopher hippies) who aren't afraid to think outside the walmart guidelines. No, this is not for people who want to vent about the state of the world. No, that is what blogs are for. SOCC-TAF is about action. And I don't mean that in a Che Guevara way. I mean that in a Gandhi way. The part of his story I love the most is his insistence that everyone spin yarn. It's so completely insane but his rationale was undeniably strong. Independence begins at home. It was solidarity with the Indian textile workers who were totally screwed over by the English textile purchasers. It was a boycott on the textile industry. He did the same thing with making salt. It's hard to change anything because we want to take short cuts. Gandhi took no short cuts so there will be no short cuts in SOCC-TAF! We will examine root causes and design strategies for the development of solutions. The inclusion of "Climate Change" in the title has nothing to do with the actual climate. It's more like a demonstration that social climate and environmental climate should be addressed the same way. There are important things to be done and I feel my research has gone deep enough. The mission statement should be simple: SOCC-TAF endeavors to address social health like a doctor treats physical health. Poverty, homelessness, environment, education, media manipulation, wages, economic strategy, will all be examined. SOCC-TAF's mission is a sustainable and inclusive culture. It is our goal to contribute to a global society and respect all cultures. We will peacefully impact the world. Blah blah blah. Something like that. Our motto: Change begins at the root. 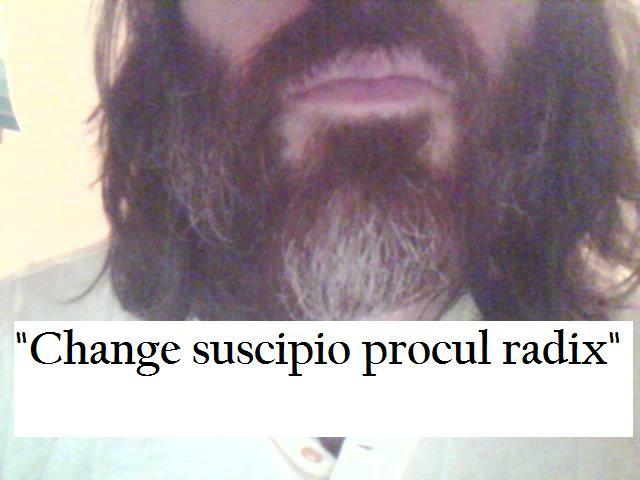 "Change suscipio procul radix"
My crumb-filled beard can be the avatar. The arctic wolf campaign will be one element of this task force. I see the arctic wolf campaign as a media outreach and consciousness-raising event. W.O.L.F is a sub-committee of the SOCC-TAF. We want to document the journey of a man claiming to be from the future as he treks north to the Arctic circle where he hopes to see the Arctic Wolf, which is extinct in the future. Ok, maybe that will remain my own endeavor. I see it as a way to make an impact with my three part strategy of 1) a character who is on an impossible mission. 2) A character who is unusual 3) A character who sacrifices everything for the mission. If you can manufacture those three things then you will create a spectacle that is interesting. And if he is interesting then his message will be received. Oggy is on a mission to see the arctic wolf because it is extinct in his time. We have the power to preserve this animal's habitat and only an overwhelming interest in Oggy's mission will change anything. The tar sands project in Canada and the oil exploration in the arctic are perfectly justifiable if all other life on earth should be obliterated for humanity's energy demands. If no one has any empathy for arctic wolves then these projects will proceed. How does one generate empathy? I get an email a day from the wildlife defender's foundation that tries to generate empathy, but they are taking short cuts. They understand what it takes but they don't have anyone willing to manufacture empathy like I've outlined here. Again, the wolf expedition is a crafted performance art piece that is designed to generate empathy and interest in the arctic wolf. Anyway, SOCCTAF is on the map. The first board of director's meeting will take place when there is another member. I've got to go update my resume.